It is time once again for redistricting. The issue has been addressed by our local Jessamine County authorities, but the task remains for those in Frankfort. 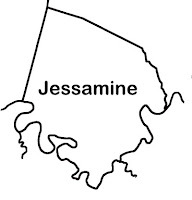 Since Jessamine County's population grew quite a bit in the last census, our legislative district borders are likely to change - possibly significantly. Rep. Bob Damron (D, Nicholasville) will need to lose about 6,000 constituents to get his representation down to the average for state legislators. Although we don't know how these lines will be drawn, it is the source of quite a bit of discussion in Frankfort. Obama for America and Organizing for America are looking for bright, motivated people for their Organizing Fellowship Program -- a 12-week program that will be held three times in 2012: spring, summer, and fall. Participants will gain hands-on campaign experience, strengthen leadership skills, and learn firsthand about the grassroots efforts that drive the campaign, including recruiting volunteers and developing relationships with supporters in communities across the country.